I know they drafted him as a place kicker but I guess they didn't tell him which place to kick. Okay, that's my effort. What's yours? Give it a go and we'll see you back here Saturday with our honourable mentions and a winner. In between time, why don't you drift on over to Margo at the Screaming Me-Me. She's an upright kinda gal and always has a great pic to take a kick at. At the very last second, Jimmy decides to go for two. "NO! NO! You're supposed to kick the BALL..the BALL!" Foot-ball. Get it? It's not called foot-ball for nuttin'. Ouch! I'm not a man and still all I got is OUCH! I have a strange feelin' that Moooog35 got is with his 8:27AM comment. Man! I just came here by way of Me-Me and now you send me back? They don't call them Longhorn steers for nothing. Oh, so that's what they mean by a "dead ball". After years of ridicule, Fred Crotchblaster's day of glory had finally come. They didn't cover this in the two-minute warning. And once again, Charlie Brown wonders why he tries to play football with Lucy! This was the day that Josh Richardson's nickname changed from "Mad Dog" to "Squeaks McGee". Oh crap! I stepped in a pile of lineman. Dude, can you help me get it off my shoe? 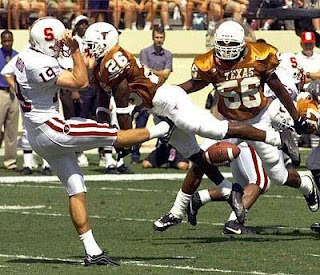 But besides that, he did set the all-time NFL record for kicking an opposing player the farthest. I think Moooooog got it again! Go for two... LOLZ.